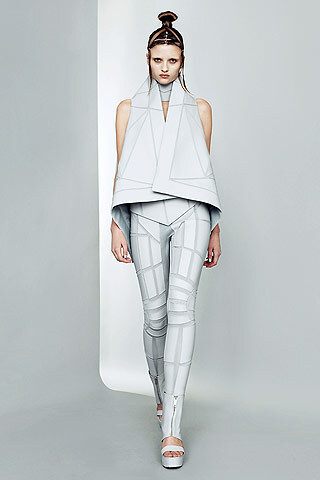 With sci-fi imperial armored apparel, Gareth Pugh enables clients to roam planet earth with superb confidence. 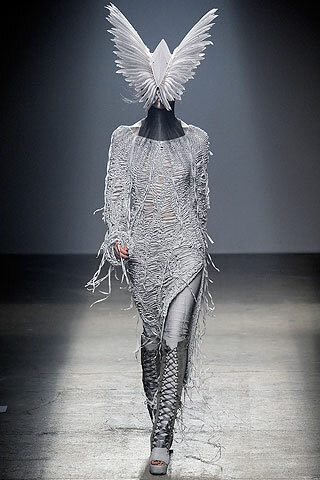 Live art in motion “the lovely Daphne Guinness” is an avid fan of Gareth Pugh. 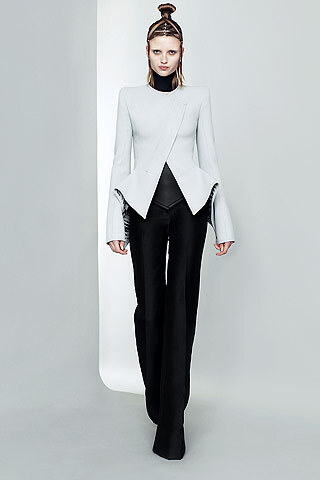 For her exhibit at the FIT Museum, she carefully chose pieces from Gareth Pugh’s collections, most notably a remarkable spiked-leather cat-suit from Fall 2009. 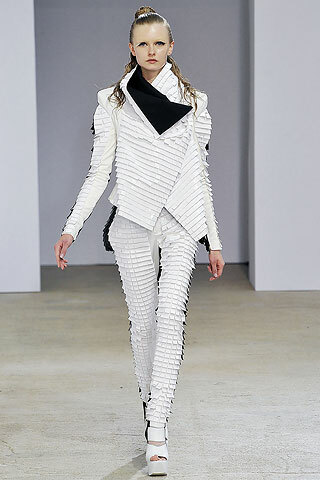 Pugh continually amazes fans with his trademark monochrome prints, geometrically cut stripe patterns, (his use of latex, sheer plastic and leather) and ultra-luxe voluminous fabric design. 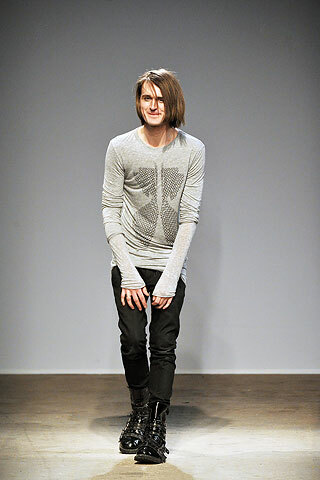 It brings me great pleasure to present Gareth Pugh, present to 2007. 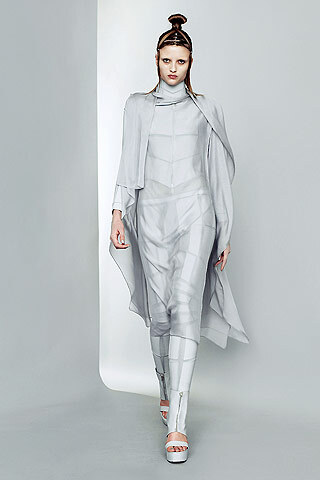 SPRING 2012: A pleasant display of window-blinds effect dresses, vests and jackets and caged garments. 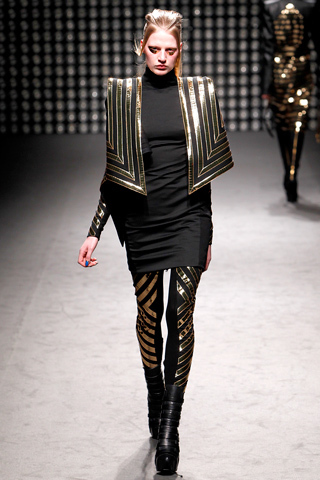 FALL 2011: Spring 2011 reminiscence of exoskeleton suits and vibrant metallic stripes. SPRING 2011: Marvelous exoskeleton suits, sheer dresses and tapered blazers. 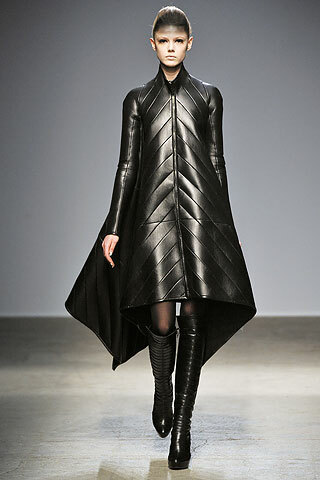 FALL 2010: Domineering leather bandage dress. 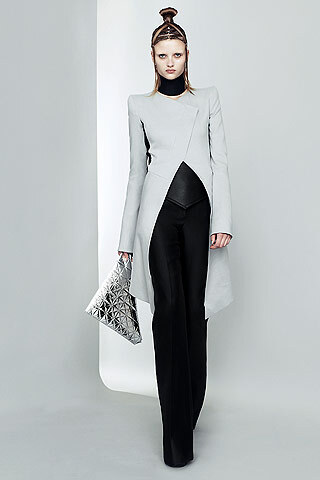 A magnificent floor-length draped long-sleeve shirt paired with shiny pants. 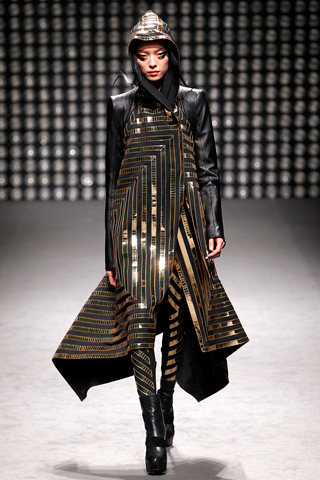 Provocative striped cowl-neck sheer tunic dress. 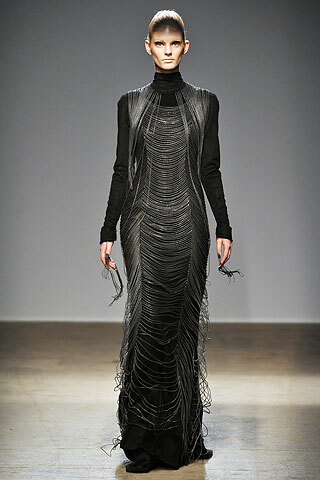 Demure leather-n-wool train dress. Chain dresses and pants bear a nostalgic resemblance to The Maid of New Orléans (Joan of Arc) and an attractively New Age long crochet cardigan. 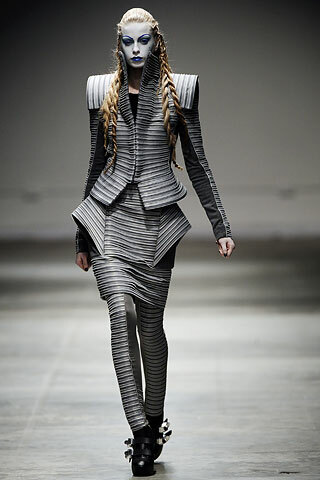 SPRING 2010: Zipper-embellished vests and jackets with elongated tails and rebelliously futuristic shredded dresses. 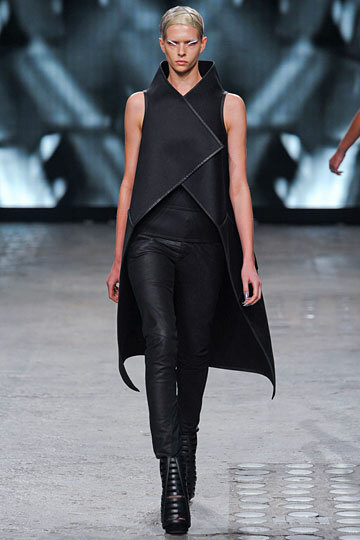 FALL 2009: Glorious leather-spiked assembles mixed with Helmut Lang idealism. SPRING 2009: Unparallel texture and visual effects. 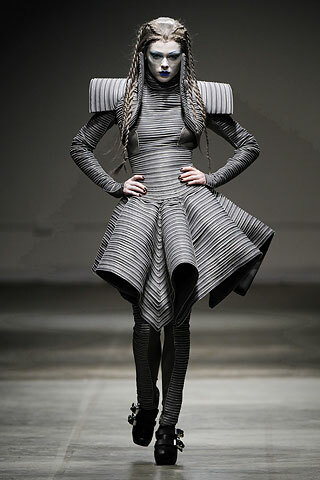 FALL 2008: Ode to Japanese Samurai armor. Mongolian ruler Genghis Kahn gets a feminized makeover. 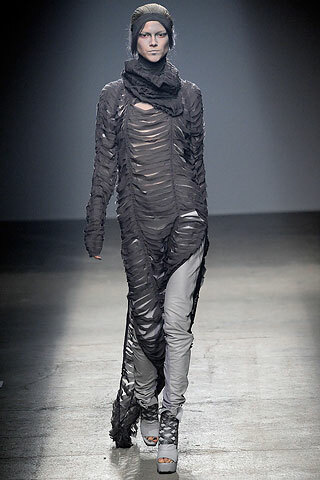 SPRING 2008: Alluring to the eyes as a multifaceted deep-sea creäture are the sparkles that hug this lycra ribbed dress. 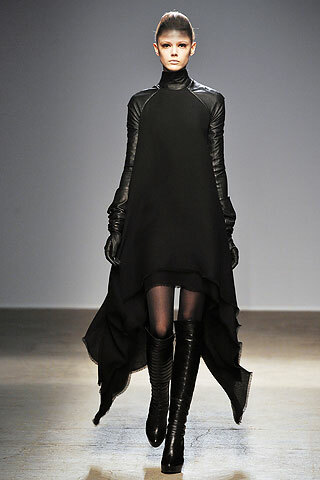 FALL 2007: A mirrored patent-leather dress is “melancholically romantic” to the likes of Alexander McQueen. SPRING 2007: Alice in Wonder Land meets Alexander McQueen in this cowl-neck checkered dress. 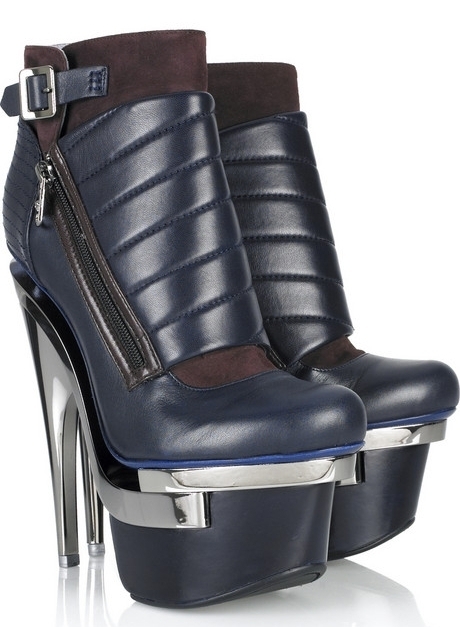 VERSACE (Metal-Heeled Leather Ankle Boots): The spirit of Gareth Pugh in a pair of leather boots that compliment skinny trousers, stove-pipe jeans, leather or latex jeggings, wool or cashmere sweaters, long cardigans, draped jerseys or racer-back tunics.